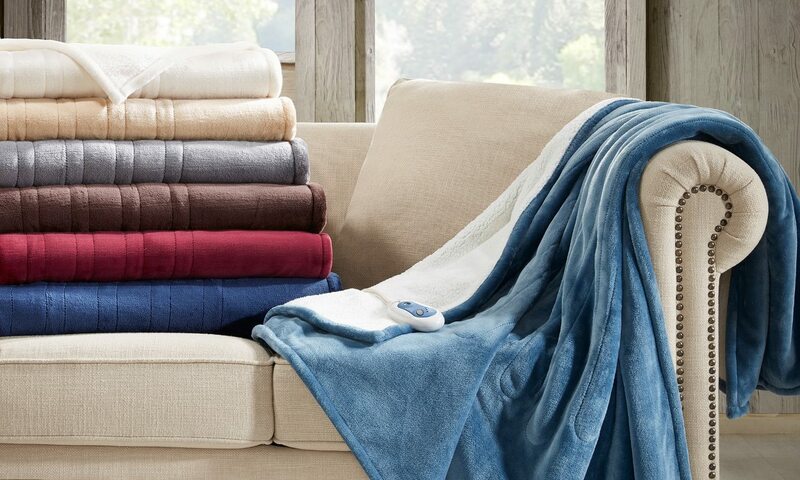 A heated blanket is perfect for keeping warm during chilly winter months or staying cozy all year long. The best electric blanket is one that combines the features you want with the highest level of comfort. Consider the following as you shop to ensure you buy an electric blanket that meets all your expectations. Electric blankets have come a long way from the thin, scratchy cloth of yesteryear. Luxury materials like faux fur, micro plush, and Sherpa make these blankets more comfortable than ever. These materials also add extra warmth for the chilliest season. Choose an electric blanket made from your material of choice for the best result. The little things can make a big difference when it comes to a heating blanket. If you or your partner is a light sleeper, then it’s best to find a blanket with a digital dial, which is quieter than its clicking analog counterpart. Queen- and king-size heated blankets usually come with two separate controls, which is perfect for couples that prefer different sleeping temperatures. It’s important to consider when and where you plan on using your electric blanket. If you are going to use it on your bed, then be sure to purchase the correct corresponding size. If you just want a blanket to snuggle with on the couch, then it might be best to opt for an electric throw blanket. There are even travel-size electric blankets for when you’re on the road. Wherever you plan to use it, choosing an appropriately-sized heated blanket is key. Newer electric blankets are usually machine washable, but most are not machine dryable. Unplug wires and follow the manufacturer’s instructions for cleaning. To ensure the safety and longevity of your heated blanket, check the electrical cord, connectors, and wires on a regular basis. Plug Location – Electric blankets usually have the connector in the middle or corner of the bottom edge. Depending on your outlet location, you may need to pay particular attention to the cord length and position. Timers – Heated blankets can have more benefits than just keeping you warm. Heat can help relieve muscle and joint pain associated with some medical conditions. Having a timer feature is ideal for when you need to apply heat to sore body parts for a certain amount of time or if you don’t want to wake up hot in the middle of the night. Heat Settings – A heated blanket with multiple temperature settings is key to regulating heat. Most blankets have three to five settings, however, some blankets have up to 20. That may seem excessive to some, but when you find a temperature that’s just right, you’ll be glad you went the extra mile. UL Certification – Underwriters Laboratories, an independent safety testing organization, will give their seal of approval in the form of a UL Certification. This certification proves that UL has tested the product and has deemed it safe for use. Not many companies physically advertise this certification, but most name brands currently on the market are UL certified. Auto Shut Off – Electric blankets have a knack for inducing naps. To avoid overheating and injuries, look for a heated blanket with an auto shut off or timer feature. Customer Reviews – Most manufacturers will list specific benefits and features, which should be considered before purchasing. However, some of the best, and unbiased, information comes from reading customer reviews.